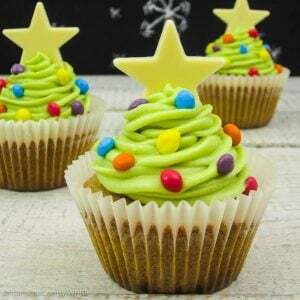 Elegance meets quirkiness in these Christmas tree cinnamon cupcakes. 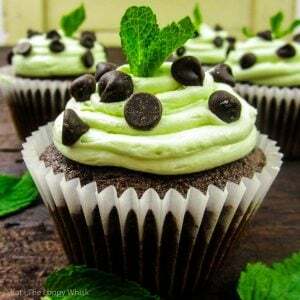 A winner in both taste and looks, they will win over children and adults alike, while being incredibly simple to make. 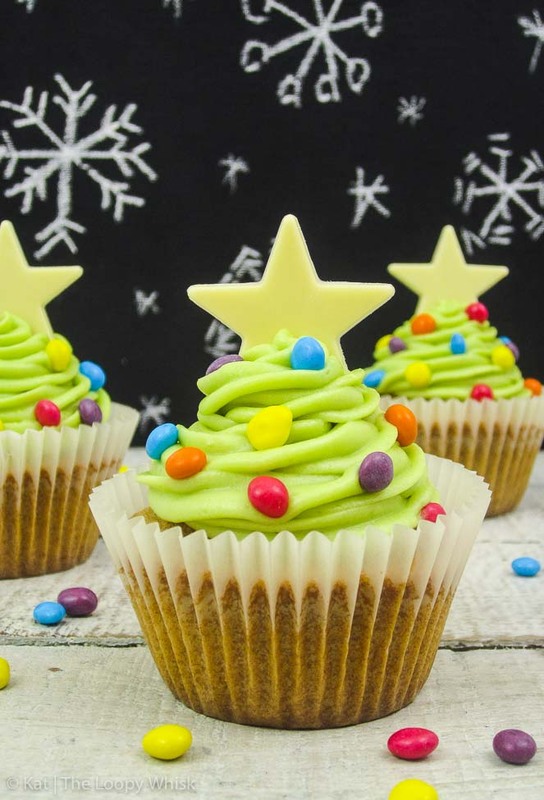 Think fluffy cinnamon cupcakes, light-as-a-cloud vanilla buttercream, and crunchy pops of chocolate goodness from the colourful decorations. Christmas trees have never tasted so good. 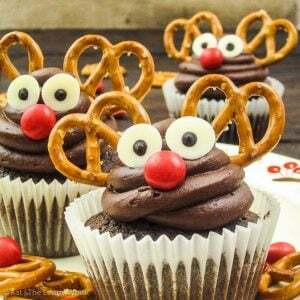 This is the second recipe in the series ‘The Loopy Christmas 2016’ (all recipes in this series can be found in the recipe index under ‘Christmas’) – watch this space for more Christmas yumminess. Missed the first recipe? 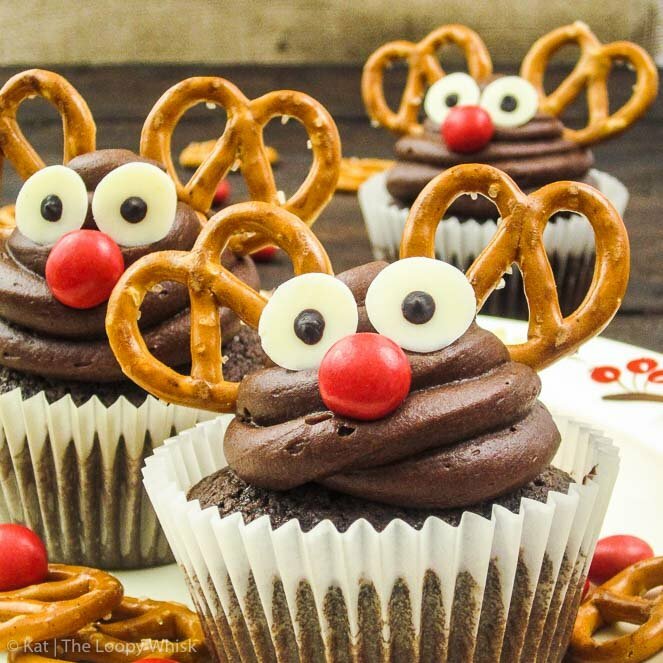 Check out these adorable Rudolph Mexican hot chocolate cupcakes! I take making cupcakes incredibly seriously. Sometimes (okay, okay… often) too seriously – it’s either the perfectionist or the scientist in me (but probably both). Let’s just say that in making these beauties tweezers were involved. 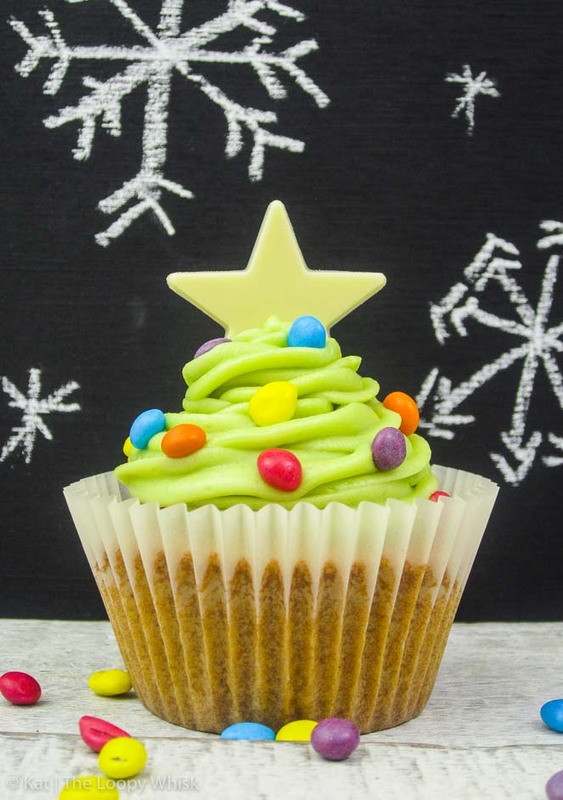 Yes, I’m sure (and hope) that the decorations on the buttercream Christmas trees look incredibly effortless. Here’s the thing: just because I have an innate Chemistry-education-induced compulsion to be annoyingly overprecise, there is no need for you to be. 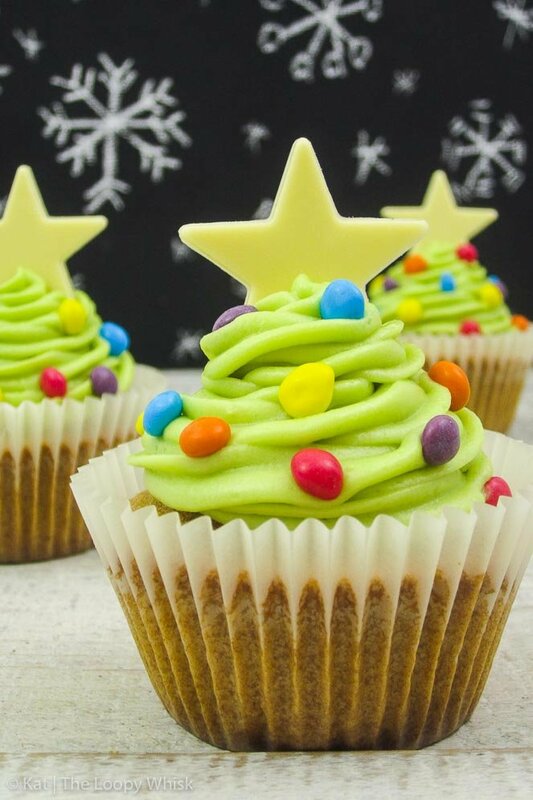 Especially not when making these Christmas tree cinnamon cupcakes. I mean, yes, do weigh out the ingredients precisely. And yes, do set the oven to the right temperature, and do bake the cupcakes for the appropriate amount of time. I’m not saying you should abandon all reason and re-discover the art of baking (or rather the art of what-the-holy-flying-hamster-are-you-doing?). I’m saying leave the tweezers alone. Seriously, put them down. Now. (Unless you’re plucking your eyebrows, in which case: sorry, and proceed. Also, how on Earth are you also reading this? I bow down to your amazingness.) Because there is beauty in the actually effortless effortlessness, and the imperfections it brings with it. You totally got this, trust me. 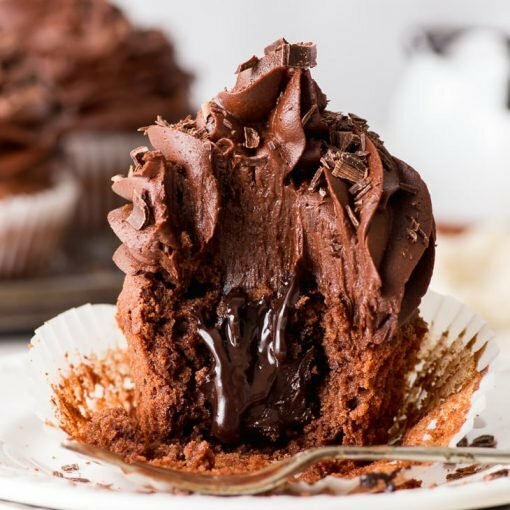 As before for the mint chocolate chip and the Rudolph Mexican hot chocolate cupcakes, we’re making the cupcakes by the throw-everything-together method. I know, how terribly time-consuming and complicated. 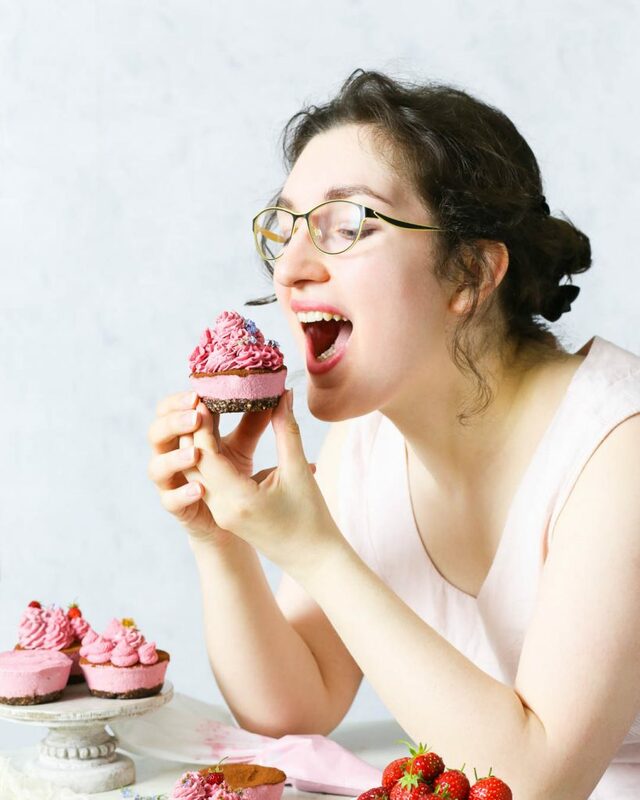 The buttercream is no better, and how do I dare recommend to you such awfully long-winded and unrewarding recipes? The best part of making these lovelies is, without doubt, the decorating. Go nuts. My decorations look like they do because that’s what I had on hand and what I like (and because tweezers, but we’ll be all hush hush about those). Want to go silver chic? Perhaps classic red-and-gold? Or are you in a ‘I-am-a-sparkly-unicorn-give-me-all-the-colour’ mood? You do you. Whatever you fancy, there are no rules. Because no matter how out-there the end result, they will still be Christmas tree cinnamon cupcakes, and people will love them (and you, if you’re willing to part with any). Because cupcakes. And cinnamon. 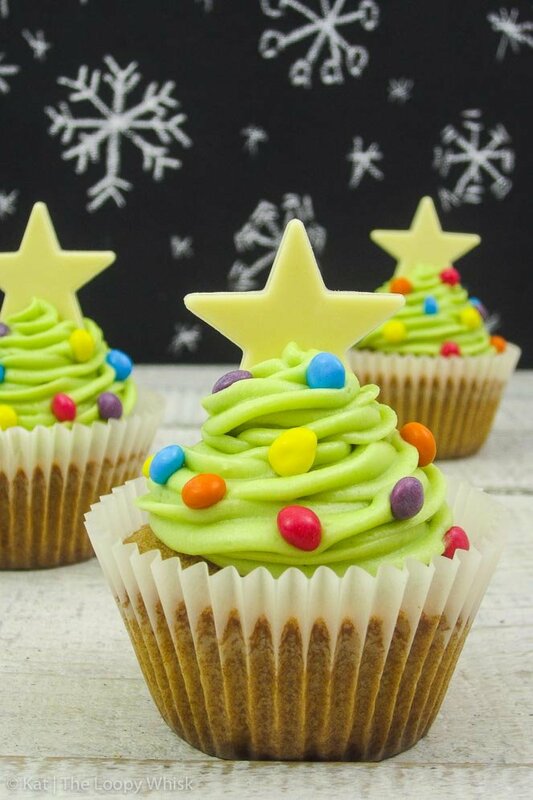 And, somehow, also yummy Christmas trees. 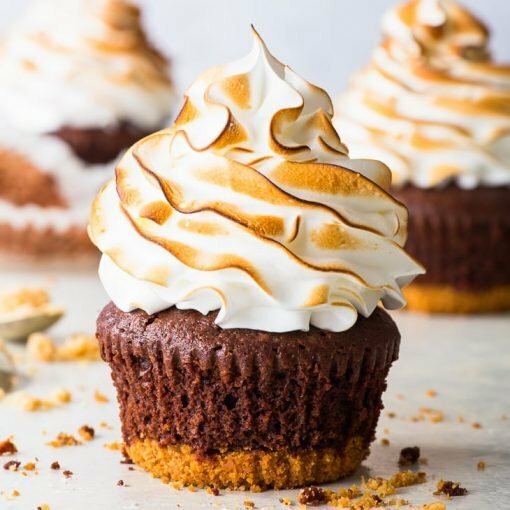 Elegance meets quirkiness in these fluffy, delicious cupcakes that will be a hit with both children and adults. You definitely won't regret making them this Christmas! Preheat oven to 340 ºF (170 ºC). Line a cupcake tray (for 12 cupcakes) with cupcake cases. Sift together flour, baking powder, bicarbonate of soda, salt, cinnamon and sugar into a large bowl. Add butter, milk, and eggs to the flour mixture. Whisk on medium to high speed for ~60 seconds (using either a paddle attachment on a stand mixer, or whisk beaters on a hand mixer), until a homogeneous batter forms. Use a spoon or an ice-cream scoop to fill the cupcake cases ~2/3 full with the cupcake batter. Bake in the preheated oven at 340 ºF (170 ºC) for about 20 minutes, or until a toothpick comes out clean. 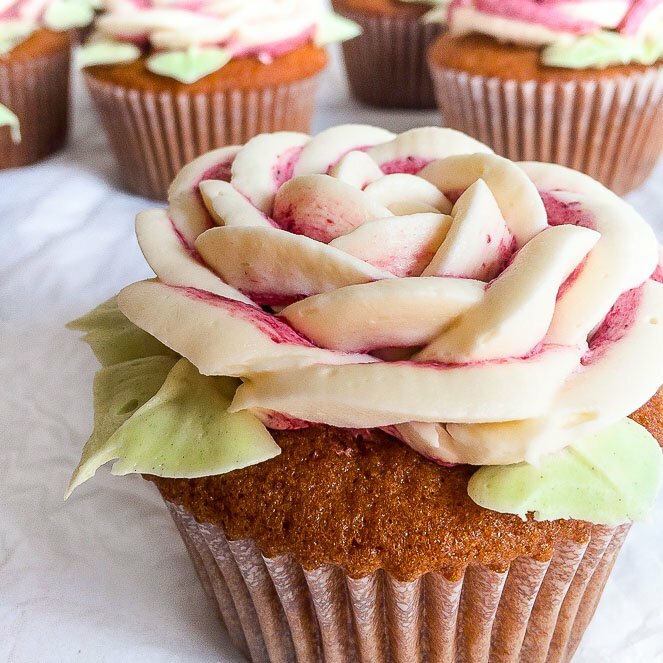 Allow to cool completely before piping on the buttercream. Beat butter and 1/2 of the icing sugar for 5 minutes with either a paddle attachment on a stand mixer, or with whisk beaters on a hand mixer. Add 1 tbsp of milk and the other 1/2 of icing sugar. Beat for an additional 5 – 7 minutes until pale and fluffy. 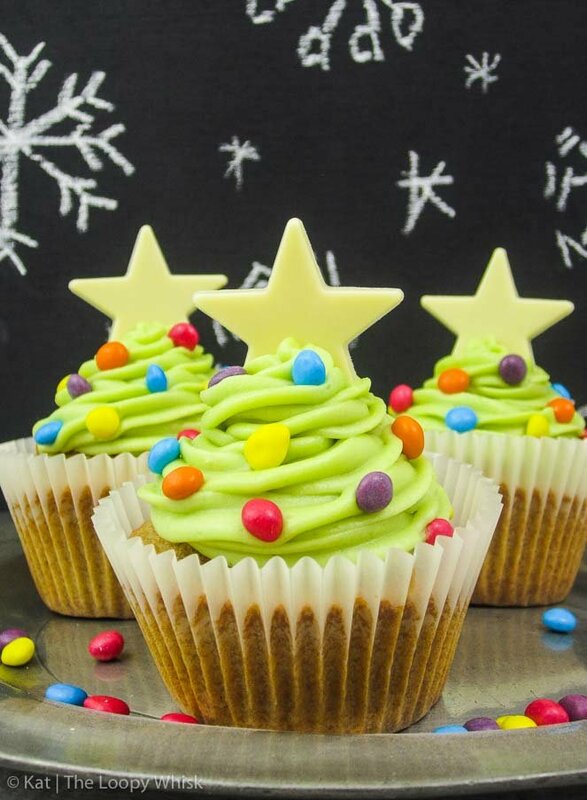 Add green food colouring, mixing for ~1 – 2 minutes, until evenly incorporated into the buttercream. Decorate with the white chocolate starts, chocolate beans, or other decorations of choice. The cupcakes can be kept in a closed container in a cool dry place for ~3 days (good luck with that). Note 1: Or use other decorations. Go crazy, and have fun! Note 2: I used a 5-point star nozzle, but feel free to experiment with star nozzles with different numbers of points to get the effect you want. 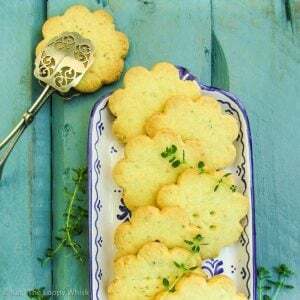 … or perhaps lemon thyme shortbread cookies? Thank you, Jenny! Yep, I completely agree – I cannot really imagine Christmas without the gloriousness that is cinnamon. 😀 And Merry Almost-There-Not-Long-Now Christmas!